This brewery is built from recycled materials, including its facade, which is made from reclaimed double-pane windows. The town of Kamikatsu is located in the Tokushima prefecture in Japan, and is known for its successful commitment to zero waste living. According to Business Insider, residents sort their waste into 34 categories at the town's waste center, a pretty tedious task that took some time to adjust to. But it has worked out so well for the citizens of Kamikatsu that they've extended their zero waste ethos into the brewing business. Treehugger reports on the birth of the Kamikatz Public House, one of several community-oriented buildings in the town, built by architecture firm Hiroshi Hakamura & NAP. The brewery is also a pub that sells general supplies and food to local residents (and lucky tourists). It is largely built from recycled materials, including its facade, which is made from reclaimed double-pane windows. "We gathered windows that illuminated the town in the past and dedicated our wish that they would serve as a lantern of hope to shine upon the town struggling with a declining population. The space is full of improvisation and discoveries with this creative combination of waste material for this architecture. The locals who gather at this pub are beginning to truly realize that their actions are fun and creative." 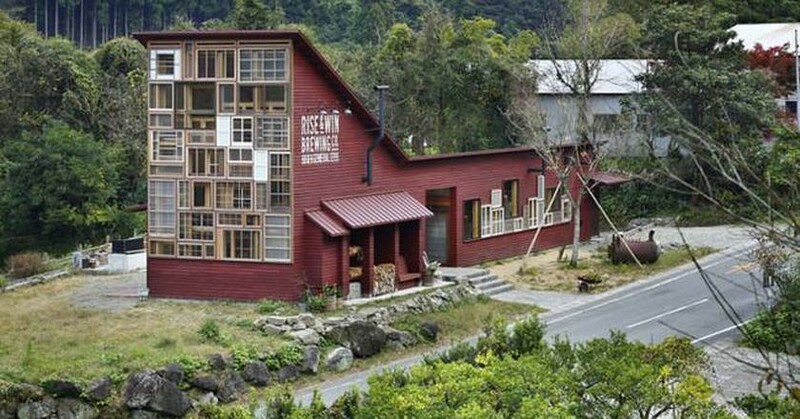 Rise & Win Brewing is just one of the latest to join the craft beer boom in Japan. Though craft breweries have long been trendy in the U.S., Japan's only recently taken interest in the industry over the past few years. And although they're relatively new at it, they're experiencing huge success. Osaka’s Minoh Brewerywon the World’s Best Imperial IPA award in 2013. The Coedo Brewery in Kawagoe won a silver in the “American-style amber lager” category at the 2014 World Beer Cup. Or visit the town yourself and have a beer.